We have become used to seeing all kinds of boats either on trailers, tied to docks or floating on a body of salt or fresh water. On the other hand when you live near water you will find olden unused boats laying on their side or they are more kindly supported upright by a wooden structure to keep them from rotting away. Now our boats are much like our cars since many families have more than one. These might include a kayak, canoe, dingy, rowboat, speedboat, sailboat or one of several styles of fishing vessels, not to mentioned jet skis personalized for every family member. However, it is the moment when you see something out of the ordinary that you stop and ponder, who, what, when, where and "why is this boat here just floating in a blackberry thicket?" 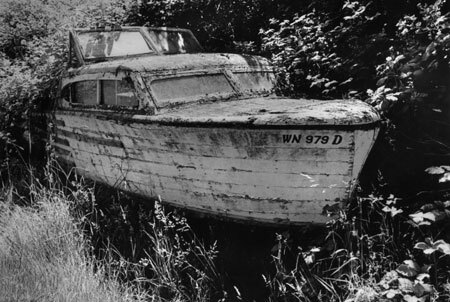 Whenever boats are found in Point Roberts we assume they are salt water craft. Our minds wander into thoughts and questions about the boat's past lives. Except for a painfully needed paint job this boat looks in good shape with really great lines and gracefulness. How many cruises did she make? Was it a family craft or work boat? Is someone coming back for her and make her smile again?